The American space program has been getting a great deal of attention lately following the final launch of the Atlantis shuttle. The awesome power of spacecraft, especially in the moments before launch, is one of the most fascinating parts of the life of any space mission. 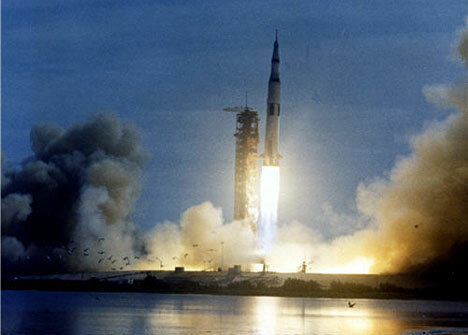 This video replays in great detail the launch of Apollo 11 on July 16, 1969: the launch that landed the first humans on the moon. The incredible video covers only about 30 seconds of real time, but is dramatically slowed down to show a great amount of detail. The film is narrated by the executive producer of Spacecraft Films, the company the produced this excellent examination of the Apollo 11 launch. The narration explains in great detail every second of the launch, from first blast to well after the spacecraft has cleared the launch tower. These eight minutes give a wonderfully different look at the historic space mission that finally satisfied man’s desire to walk on the surface of the moon. See more in Vintage Videos or under Vintage & Retro. May, 2010.